Most families have at least one person who’s always working up a sweat, and they have the t-shirts to prove it. No need to throw them out and buy new ones. Simply follow the tips in this Molly Maid cleaning video. 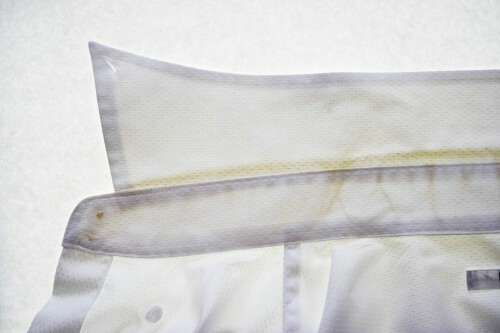 How it’s done: All that’s needed for this solution to sweat stains is ammonia, water, and dish soap. Put equal parts water and ammonia together, while mixing in a few tablespoons of the dish soap. With this newly-created liquid on hand, put the sweat stained clothes into the mixture overnight. The next day, simply remove the clothes and clean them normally in the washing machine. No special attention is needed for the dryer either.